Training isn't only in the gym but on the field or in the streets too. When hitting the outside make sure you're prepared in this Under Armour UA Rush Run S/S Compression Top in /mod Grey and Black. 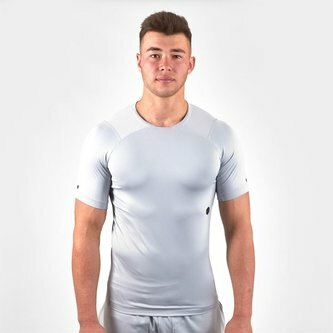 This to from Under Armour has been designed in an ultra-tight fit so that it feels just like a second skin.This top is perfect for training as when you body emits energy the mineral-infused fabric absorbs and reflects back into tissues and muscles improving your endurance and strength. With mesh panel providing strategic ventilation this top has short raglan sleeves and a low profile collar construction.